Drown me on my return but spare me as I go." This curiosity is authenticated by the letter in which he sent it, lately in the possession of his sister. 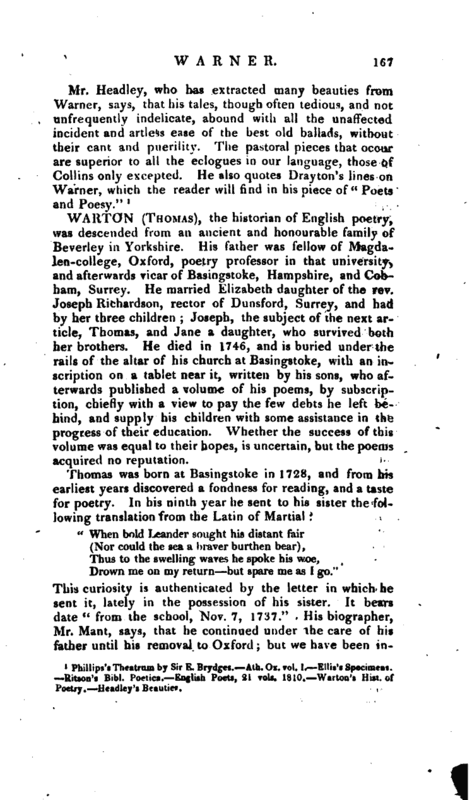 It bears date “from the school, Nov. 7, 1737.” His biographer, Mr. Mant, says, that he continued under the care of his father until his removal to Oxford; but we have been | informed that he was placed for some time at Basingstokeschool. In March 1743, in his. sixteenth year, he was admitted a commoner of Trinity-college, and soon after was elected a scholar. How much he was ever attached to that college, his writings, and a residence of forty-seven years, with very few intervals, sufficiently shew. In 1745, he is said to have published “four Pastoral Eclogues;” but this appears to be a mistake. 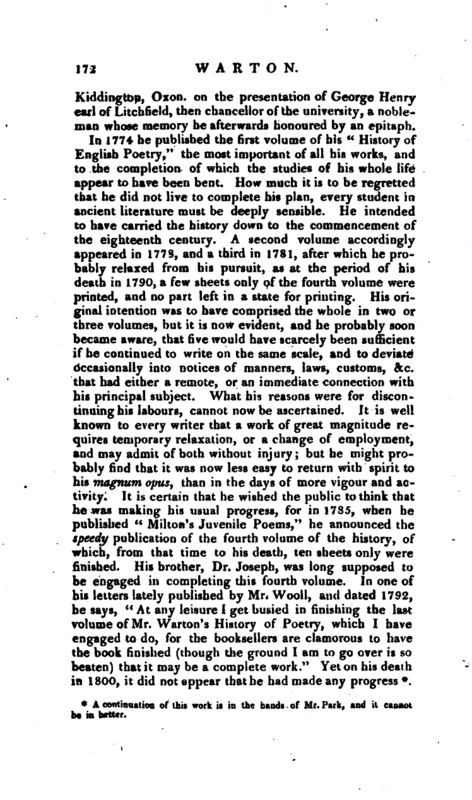 About this time, however, he sent one or two articles to Dodsley’s Museum * to which his brother was likewise a contributor; but his first detached publication was “The Pleasures of Melancholy,” of which the first copy differs considerably, particularly in the introductory part, from that published in his collection of poems. 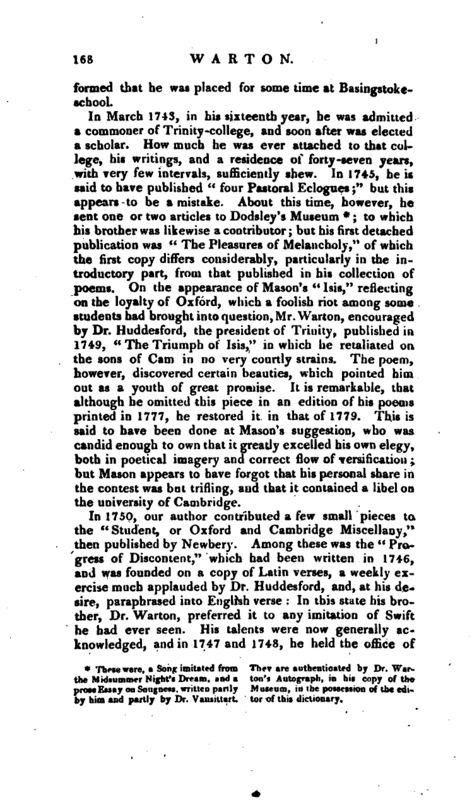 On the appearance of Mason’s “Isis,” reflecting on the loyalty of Oxford, which a foolish riot among some students had brought into question, Mr. Warton, encouraged by Dr. Huddesford, the president of Trinity, published in 1749, “The Triumph of Isis,” in which he retaliated on the sons of Cam in no very courtly strains. The poem, however, discovered certain beauties, which pointed him out as a youth of great promise. It is remarkable, that although he omitted this piece in an edition of his poems printed in 1777, he restored it in that of 1779. 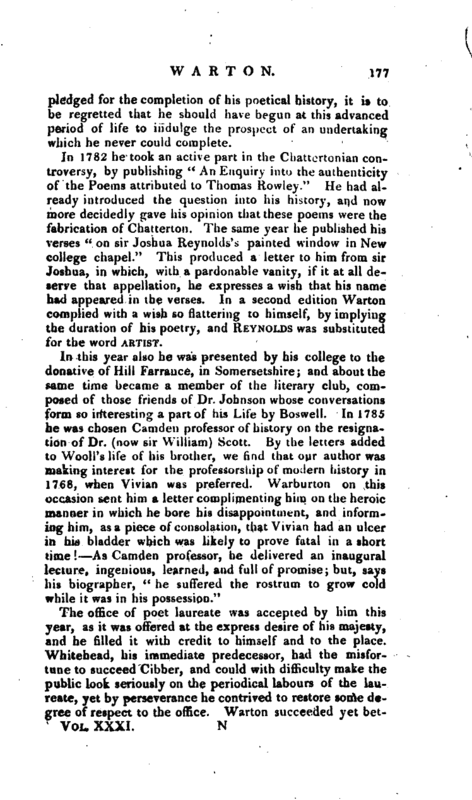 This is said to have been done at Mason’s suggestion, who was candid enough to own that it greatly excelled his own elegy, both in poetical imagery and correct flow of versification; but Mason appears to have forgot that his personal share in the contest was but trifling, and that it contained a libel on the university of Cambridge. Thse were, a Song imitated from the Midsummer Night’s Dream, and a prose Essay on Snngness, written partly foy him and partly by Dr. Vausiitart. They are authenticated by Dr. Warton’s Autograph, in his copy of the Museum, in the possession of the editor of this dictionary. | poet laureate, conferred upon him according to an ancient practice in the Common- room of Trinity-college. The duty of this office was to celebrate a lady chosen by the same authority, as the lady-patroness; and Warton performed this task, on an appointed day, crowned with a wreath of laurel. The verses, which Mr. Mant says are still to be seen in the Common-room, are written in an elegant and flowing style, but he has not thought them worthy of transcription. In 1750, he took his master’s degree; and in 1751, succeeded to a fellowship. In this last year, he published his excellent satire entitled “Newmarket;” “An Ode to Music performed at the Theatre;” and verses “on the death of Frederic prince of Wales,” which he inserted in the Oxford collection, under the fictitious name of John Whetham; a practice not uncommon. 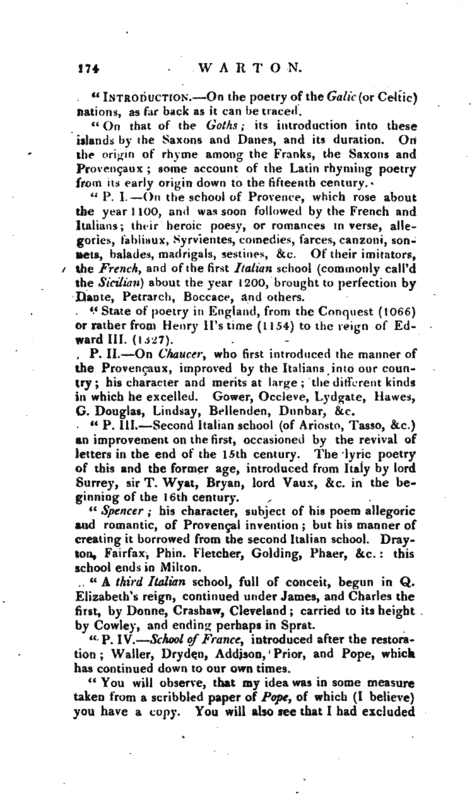 In 1753, appeared at Edinburgh “The Union, or Select Scots and English Poems.” Mr. Warton was the editor of this small volume, in which he inserted his “Triumph of Isis,” and other pieces, particularly the “Ode on the approach of Summer,” and the “Pastoral in the manner of Spenser,” which is said to be written by a gentleman formerly of the university of Aberdeen. Why he should make use of such a deception, cannot now be discovered. About 1754, he drew up from the Bodleian and Savilian statutes, a body of statutes for the Radcliffe library. In the same year he published his “Observations on the Faerie Queene of Spenser,” in one volume octavo, which were afterwards enlarged and published in two volumes, 1762. By this work he not only established his character as aa acute critic, but opened to the world at large that new and important field of criticism and illustration which has since been so ably cultivated by Steevens, Malone, Reed, Todd, and other commentators on our ancient poets. * The following paragraph from specimen of the whole. “Sect. If, He Huggins’s pamphlet will be a sufficient (Warton) resumes the poisonous | aciinow in his thirty-sixth year, had employed fully half that time in an unwearied perusal of the old English poets and such contemporary writers as could throw light on their obscurities. The” Observations on Spenser“must have evidently been the result of much industry and various reading, aided by a happy memory. In 1757, on the resignation of Mr. Hawkins of Pembroke college, our author was elected professor of poetry, which office, according to the usual practice, he held for ten years. His lectures were elegant and original. The translations from the Greek anthologies, now a part of his collected poems, were first introduced in them; and his” Dissertatio de Poesi Bucolica Graecorum,“which he afterwards enlarged and prefixed to his edition of Theocritus, was also a part of the same course. During the publication of the” Idler“he sent to Dr. Johnson, with whom he had long been intimate, Nos. 33, 93, and 96 of that paper. 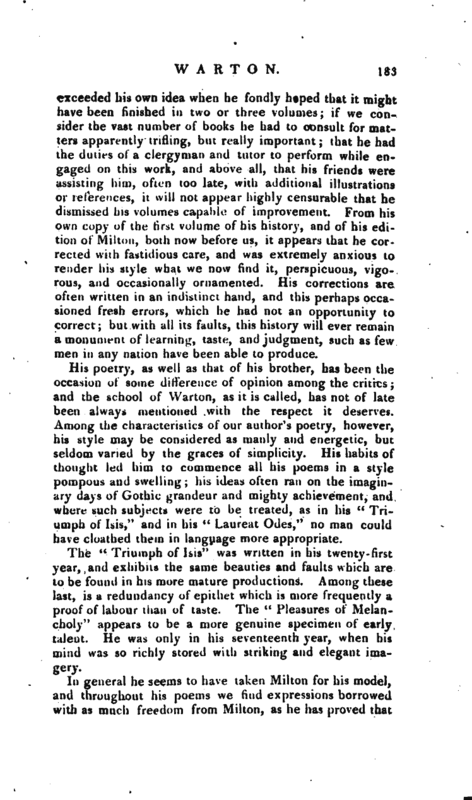 His biographer, however, is mistaken in supposing that he contributed any papers to the” Connoisseur.“His being invited by Colman and Thornton to engage in a periodical publication has no relation to the” Connoisseur.“It was Moore, the editor of the” World,“who projected a Magazine, soon after the conclusion of that paper, and told the two Wartons that” he wanted a dull plodding fellow of one of the universities, who understood Latin and Greek." 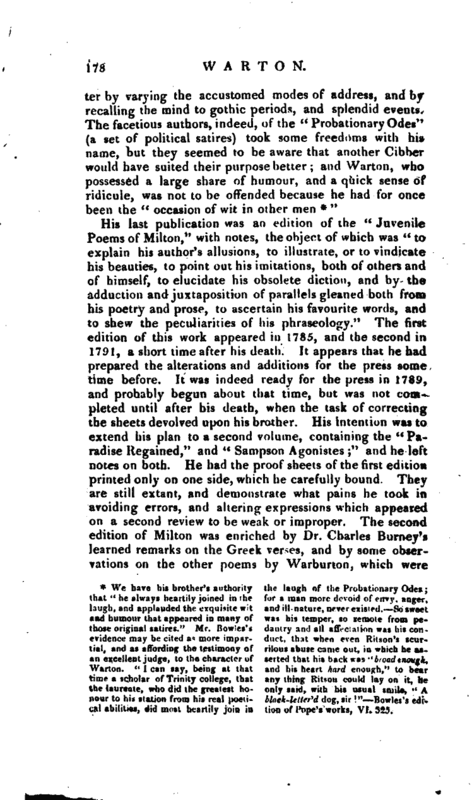 Mr. Bedingfield, one of Dodsley’s poets, and Gataker, the surgeon, were to be concerned in this Magazine, but Moore’s death prevented the execution of the scheme. In 1760 he published, but without his name, “A description of the City, College, and Cathedral of Winchester,” 12mo. From his own copy, in the possession of the present editor, he appears to have been preparing a new edition about 1771, which was perhaps prevented by a “History of Winchester‘ 7 published soon after in two vomony with which he charges his wea- let us pass the chronicles of the seven pon, which he takes care shall be ju- champions, Morte Arlhur, sir Tristram, diciously two-edged, lest it fail of slash- the Blatant Beast, the Questyn Beast, ing. friend as well as foe. * Although which is afterwards more particularly (saith our observer) Spenser formed his described, wiih a bed-roll of quotations, Faerie Queene upon the fanciful plan no less delectable than erudite, most of Ariosto.’ Poor Spenser Wretched appositely collected, to give not only Ariosto And oh most mighty War- a dignity, but also a magnitude to this ton - Let this suffice, for reply to all important tome that purchasers may he here advances of falsehood against be well supply’d for their disbursement Ariosto, which that poem totally con- of pence, either in their meditative fufronts such falsehood, that were it irrigations, or at the Cloacmian offertruth, is insipid and immaterial; and tory.” | lumes, a more showy work, but far more inaccurate. In the same year (1760) he published a piece of exquisite humour, entitled “A Companion to the Guide, and a Guide to the Companion, being a complete Supplement to all the accounts of Oxford hitherto published.” This passed through three editions in a very short time, but for some years has been ranked among scarce books *. A more scarce work, however, is his “Inscriptionum Romanarum Metricarmn Delectus,” 4 to, which ought to have been noticed under the year 1758. The design of this collection was to present the reader with some of the best Roman epigrams and inscriptions, taken from the “Elegantiae antiquorum marmorum,” from Mazochius, Smetius, Gruterus, and other learned men. It contains likewise a few modern epigrams, one by Dr. Jortin, and five’by himself, on the model of the antique, the whole illustrated with various readings and notes. 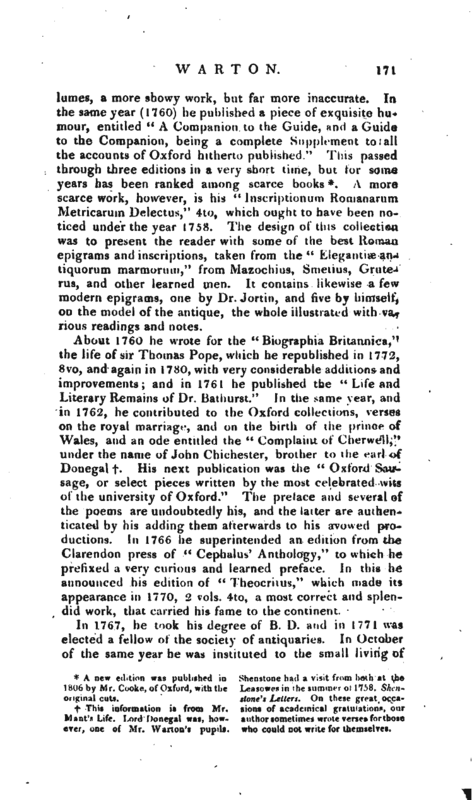 About 1760 he wrote for the “Biographia Britannica,” the life of sir Thomas Pope, which he republished in 1772, 8vo, and again in 1780, with very considerable additions and improvements; and in 1761 he published the “Life and Literary Remains of Dr. Batburst.” In the same year, and in 1762, he contributed to the Oxford collections, verses on the royal marriage, and on the birth of the prince of Wales, and an ode entitled the “Complaint of Cherwell,” under the name of John Chichester, brother to the earl of Donegal f. His next publication was the “Oxford Sausage, or select pieces written by the most celebrated wits of the university of Oxford.” The preface and several of the poems are undoubtedly his, and the latter are authenticated by his adding them afterwards to his avowed productions. In 1766 he superintended an edition from the Clarendon press of “Cephalus’ Anthology,” to which he prefixed a very curious and learned preface. In this he announced his edition of “Theocritus,” which made its appearance in 1770, 2 vols. 4to, a most correct and splendid work, that carried his fame to the continent. A continuation of this work is in the bands of Mr. Park, and it cannot be in better. | Mr. Warton’s biographer has traced the origin of this work to Pope, who, according to Ruffhead, had sketched a plan of a history of poetry, dividing the poets into classes or schools; but Ruffhead’s list of poets is grossly erroneous. 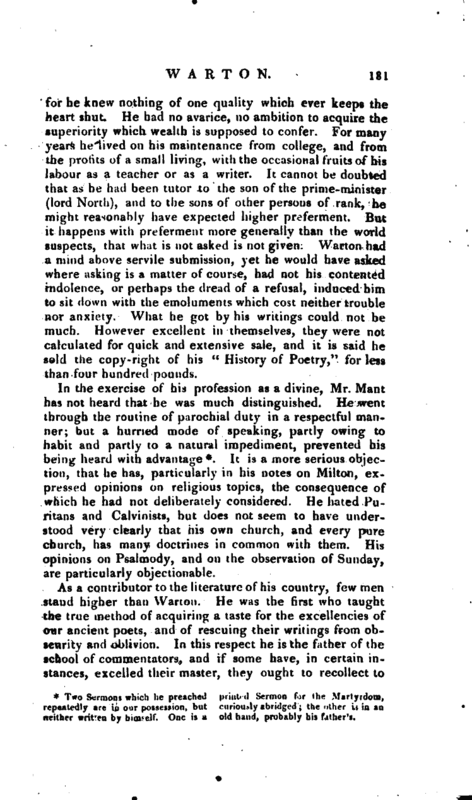 Gray, however, Mr. Mason informs us, had meditated a history of English poetry, in which Mason was to assist him. Their design was to introduce specimens of the Provencal poetry, and of the Scaidic, British, and Saxon, as preliminary to what first deserved to be called English poetry about the time of Chaucer, from whence their history, properly so called, was to commence. Gray, however, was deterred by the magnitude of the undertaking; and being informed that Warton was employed on a similar design, more readily relinquished his own. "Sir, 15th April, 1770, Pembroke Hall. 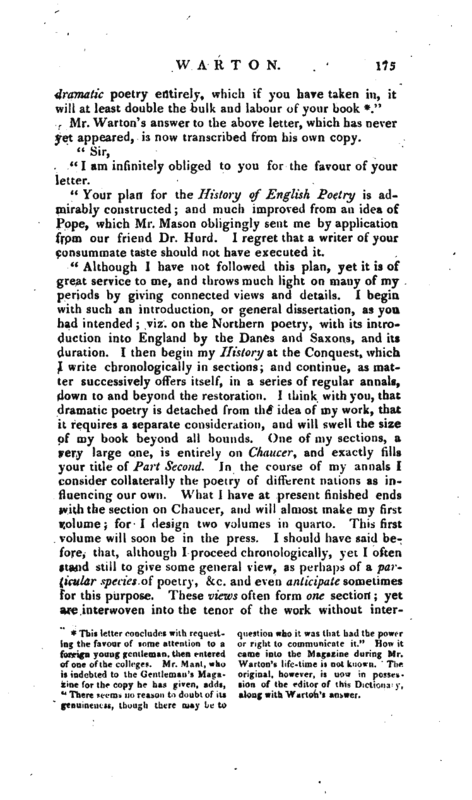 “Our friend, Dr. Hurd, having long ago desired me in your name to communicate any fragments, or sketches of a design I once had to give a history of English poetry, you may well think me rude or negligent, when you see me hesitating for so many months before I comply with your request, and yet (believe me) few of your friends have been better pleased than I to find this subject (Surely neither unentertaining, nor unuseful) had fallen into hands so likely to do it justice; few have felt a higher esteem for your talents, your taste and industry; in truth, the only cause of my delay has been a sort of diffidence, that would not let me send you any thing so short, so slight, and so imperfect as the few materials I had begun to collect, or the observations I had made on them. A sketch of the division and arrangement of the subject, however, 1 venture to transcribe, and would wish to know whether it corresponds in any thing with your own plan, for I am told your first volume is already in the press. | ”Introduction. On the poetry of the Galic (or Celtic) nations, as far back as it can be traced. "On that of the Goths; its introduction into these islands by the Saxons and Danes, and its duration. On the origin of rhyme among the Franks, the Saxons and Provengaux; some account of the Latin rhyming poetry from its early origin down to the fifteenth century. <; P. I. On the school of Provence, which rose about the year 1100, and was soon followed by the French and Italians; their heroic poesy, or romances in verse, allegories, fabliaux, Syrvientes, comedies, farces, canzoni, sonnets, balades, madrigals, sestines, &c. Of their imitators, the French, and of the first Italian school (commonly call’d the Sicilian] about the year 1200, brought to perfection by Dante, Petrarch, Boccace, and others. "State of poetry in England, from the Conquest (1066) or rather from Henry IPs time (1154) to the reign of Edward III. (1327). P. II. On Chaucer, who first introduced the manner of the Provencaux, improved by the Italians into our country; his character and merits at large; the different kinds in which he excelled. Gower, Occleve, Lydgate, Hawes, G. Douglas, Lindsay, Bellenden, Dunbar, &c.
"P. III. Second Italian school (of Ariosto, Tasso, &c.) an improvement on the first, occasioned by the revival of letters in the end of the 15th century. The lyric poetry of this and the former age, introduced from Italy by lord Surrey, sir T. Wyat, Bryan, lord Vaux, &c. in the beginning of the 16th century. "Spencer his character, subject of his poem allegoric and romantic, of Provencal invention but his manner of creating it borrowed from the second Italian school. Drayton, Fairfax, Phin. Fletcher, Golding, Phaer, &c. this school ends in Milton. "A third Italian school, full of conceit, begun in Q. Elizabeth’s reign, continued under James, and Charles the first, by Donne, Crashaw, Cleveland; carried to its height by Cowley, and ending perhaps in Sprat. "P. IV. School of France, introduced after the restoration Waller, Dryden, Addison, Prior, and Pope, which has continued down to our own times. "I am infinitely obliged to you for the favour of your letter. 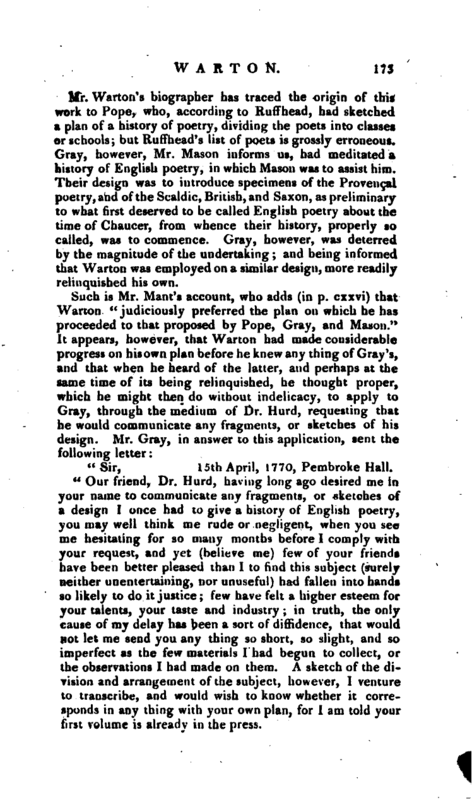 "Your plan for the History of English Poetry is admirably constructed and much improved from an idea of Pope, which Mr. Mason obligingly sent me by application from our friend Dr. Hurd. I regret that a writer of your consummate taste should not have executed it. foreign young gentleman, then entered came into the Magazine during Mr.
"There seem* no reason to doubt, of its along with Warion’s answer, genuineness, though there may be to | rupting my historical series. In this respect, some of my sections have the effect of your parts, or divisions *. “I cannot take my leave without declaring, that my strongest incitement to. prosecute the History of English Poetry is the pleasing hope of being approved by you, whose true genius I so justly venerate, and whose genuine poetry has ever given me such sincere pleasure.” Winchester college, April 20, 1770. I am, sir, &c."
It is almost needless to say that the progress of Warton’s History afforded the highest gratification to every learned and elegant mind. 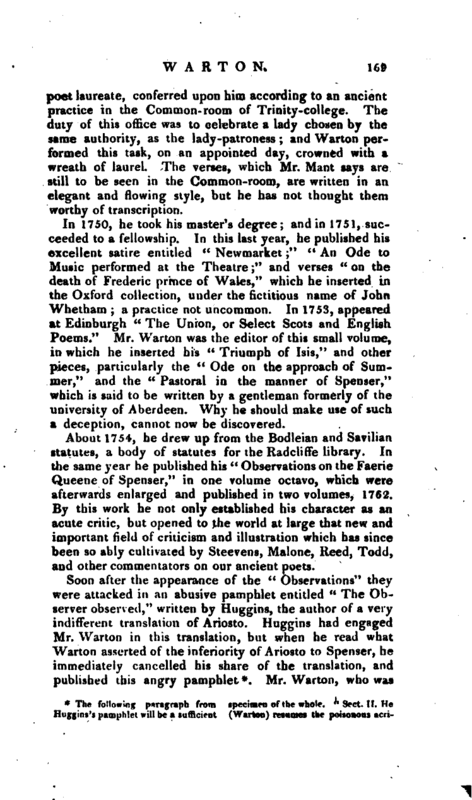 Hitson, however, whose learning appears to have been dear to him only as it administered to his illiberality, attacked our author in a pamphlet entitled “Observations on the three first volumes of the History of English Poetry, in a familiar letter to the author,” 1782. In this, while he pointed out some real inaccuracies, for which he might have received the thanks of the historian, his chief object seems to have been to violate, by low scurrility and personal acrimony, every principle of liberal criticism, and of that decorous interchange of respect which men of learning, not otherwise acquainted, preserve between one another. What could have provoked all this can be known only to those who have dipped into a heart rendered callous by a contempt for every thing sacred and social. In 1781 he seems to have devoted his mind to a plan as arduous as his History of Poetry. He had been for some time making collections for a parochial history, or, as it is more usually called, a c’ounty history of Oxfordshire. As a specimen, he printed a few copies of the History of the parish of Kiddington, which were given to his friends, but in 1782 an edition was offered to the public. Topography had long formed one of his favourite studies, and the acuteness with which he had investigated the progress of ancient architecture f, gave him undoubtedly high claims to the honours of an antiquary but as he stood of Holboro, 1800. | pledged for the completion of his poetical history, it is to be regretted that he should have begun at this advanced period of life to indulge the prospect of an undertaking which he never could complete. In 1782 he took an active part in the Chattertonian controversy, by publishing “An Enquiry into the authenticity of the Poems attributed to Thomas Rowley.” He had already introduced the question into his history, and now more decidedly gave his opinion that these poems were the fabrication of Chatterton. The same year he published his verses “on sir Joshua Reynolds’s painted window in New college chapel.” This produced a letter to him from sir Joshua, in which, with a pardonable vanity, if it at all deserve that appellation, he expresses a wish that his name had appeared in the verses. 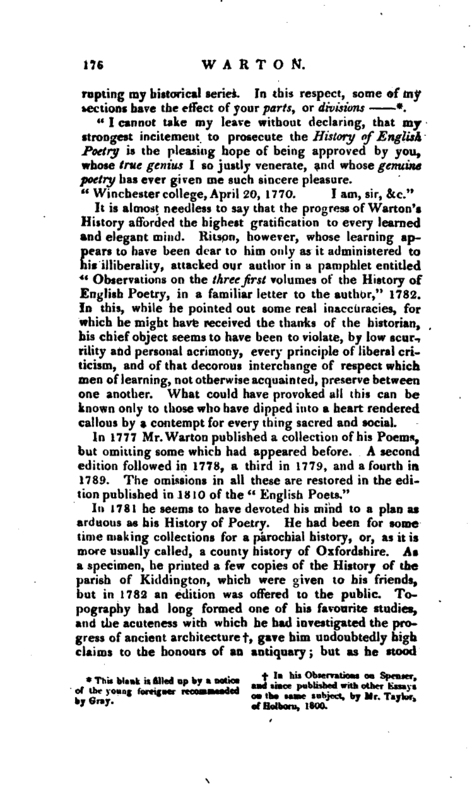 In a second edition Warton complied with a wish so flattering to himself, by implying the duration of his poetry, and Reynolds was substituted for the word Artist. * We have his brother’s authority the laugh of the Probationary Odes; that “he always heartily joined in the for a man more devoid of envy, anger, laugh, and applauded the exquisite wit and ill-nature, never existed. So sweet aad humour that appeared in many of was his temper, so remote from pethose original satires.” Mr. Bowles’s dantry and all affectation was his conevidence may be cited a? more impar- duct, that when even Ritson’s scurtial, and as affording the testimony of rilous abuse came out, in which he asan excellent judge, to the character of sertcd that his back was “broad enough, Warton.” I can say, being at that and his heart hard enough,“to bear time a scholar of Trinity college, that anything Ritsou could lay on it, h* the laureate, who did the greatest ho- only said, with hii usual smile,” A nour to hi* station from his real poeti- black-lettered dog, sir" Bowles’s edita.1 abilities, did most heartily join in tion of Pope’s wvrks, VI. 325. | communicated to the editor by Dr. Kurd. At the time of our author’s death a new edition of his Poems was also preparing for publication. His death was somewhat sudden. Until his sixty-second year he enjoyed vigorous and uninterrupted health. On being seized with the gout he went to Bath, from which he returned recovered, in his own opinion, but it was evi­‘dent to his friends that his constitution had received a fatal shock. On Thursday, May 20, 1790, he passed the evening in the Common-room, and was for some time more cheerful than usual. Between ten and eleven o’clock he was suddenly seized with a paralytic stroke, and expired next day about two o’clock. On the 27th his remains were interred in the anti-chapel of Trinity college, with the highest academical honours; the ceremony being attended not only by the members of his own college, but by the vice-chancellor, heads of houses, and proctors. His grave is marked by a plain inscription, which enumerates his preferments, with his age and the date of his death. 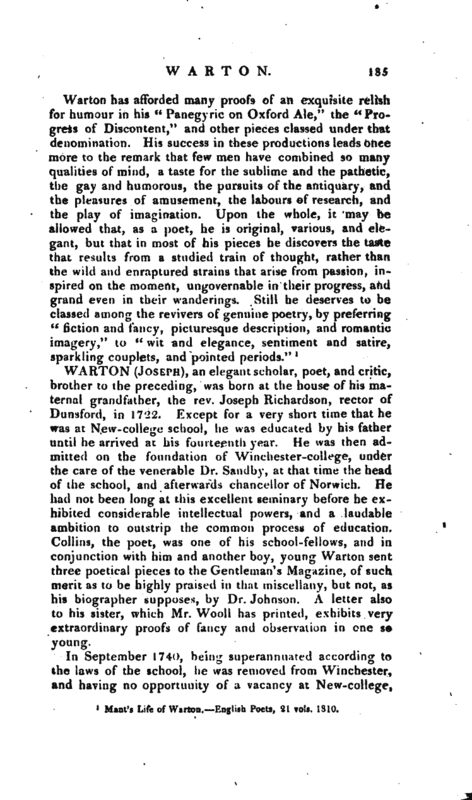 Baldwin’s Literary Journal, 1803, where are some other anecdotes and characteristics very honourable to Mr. Warton, and evidently written by one who knew him well. 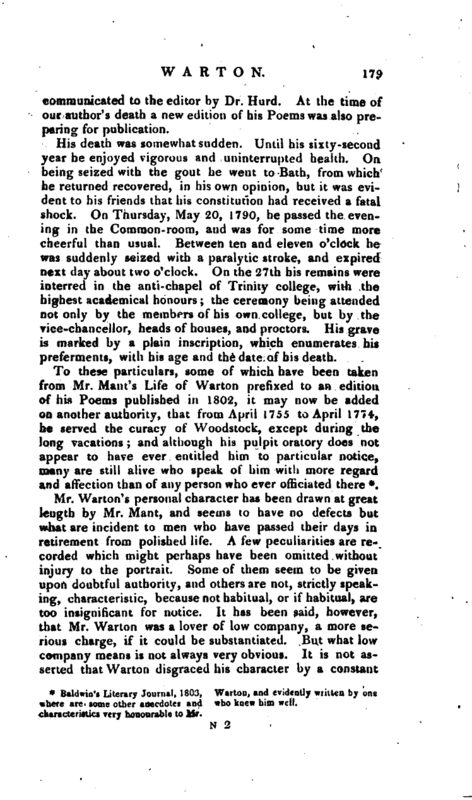 Mr. Warton’s personal character has been drawn at great length by Mr. Mant, and seems to have no defects but what are incident to men who have passed their days in retirement from polished life. A few peculiarities are recorded which might perhaps have been omitted without injury to the portrait. Some of them seem to be given upon doubtful authority, and others are not, strictly speaking, characteristic, because not habitual, or if habitual, are too insignificant for notice. It has been said, however, that Mr. Warton was a lover of low company, a more serio.us charge, if it could be substantiated. But what low company means is not always verp obvious. 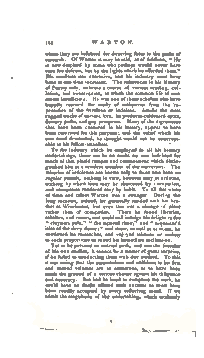 It is not asserted that Warton disgraced his character by a constant | Association with such; and that he should have occasionally amused himself with the manners and conversation of humble tradesmen, mechanics, or peasants, was surely no great crime in one whose researches imposed in some degree, the necessity of studying mankind in all ranks, and who, in the illustration of our ancient poets, had evidently profited by becoming acquainted with the conversation of the modern vulgar. His temper was habitually calm. His disposition gentle, friendly, and forgiving. His resentments, where he could be supposed to have any, were expressed rather in the language of jocularity than anger. 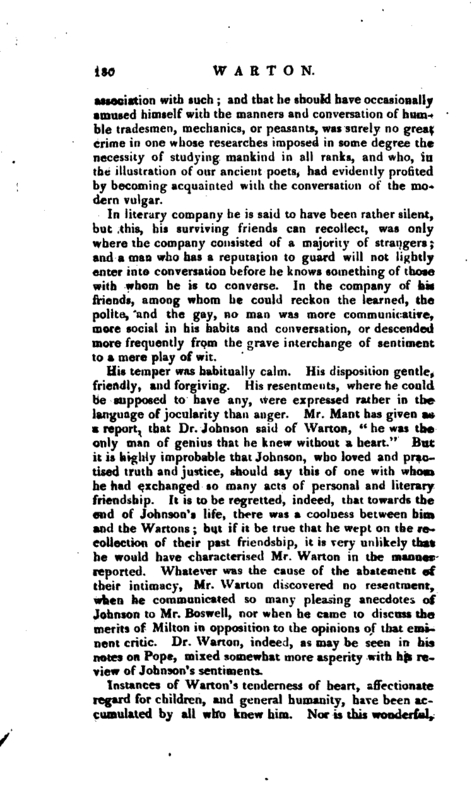 Mr. Mant has given as a report, that Dr. Johnson said of Warton, “he was the only man of genius that he knew without a heart.” But it is highly improbable that Johnson, who loved and practised truth and justice, should say this of one with whom he had exchanged so many acts of personal and literary friendship. It is to be regretted, indeed, that towards the end of Johnson’s life, there was a coolness between him and the Wartons; but if it be true that be wept on the recollection of their past friendship, it is very unlikely that he would have characterised Mr. Warton in the manner reported. Whatever was the cause of the abatement of their intimacy, Mr. Warton discovered no resentment, when he communicated so many pleasing anecdotes of Johnson to Mr. Boswell, nor when he came to discuss the merits of Milton in opposition to the opinions of that eminent critic. Dr. Warton, indeed, as may be seen in his notes on Pope, mixed somewhat more asperity with his review of Johnson’s sentiments. Instances of Warton’s tenderness of heart, affectionate regard for children, and general humanity, have been accumulated by all who knew him. Nor is this wonderful. | for he knew nothing of one quality which ever keeps the heart shut. He had no avarice, no ambition to acquire the superiority which wealth is supposed 1 to confer. For many years he lived on his maintenance from college, and from the profits of a small living, with the occasional fruits of his labour as a teacher or as a writer. It cannot be doubted that as he had been tutor to the son of the prime-minister (lord North), and to the sons of other persons of rank, he might reasonably have expected higher preferment. But it happens with preferment more generally than the world suspects, that what is not asked is not given. Warton had a mind above servile submission, yet he would have asked where asking is a matter of course, had not his contented indolence, or perhaps the dread of a refusal, induced him to sit down with the emoluments which cost neither trouble nor anxiety. What he got by his writings could not be much. However excellent in themselves, they were not calculated for quick and extensive sale, and it is said he sold the copy-right of his “History of Poetry,” for less than four hundred pounds. Two Sermons which he preached repeatedly are in our possession, neither written by himself. One is a printed Sermon for the Martyrdom, but curiously abridged; the other is in an old hata.d, probably his father’s. It is a more serious objection, that he has, particularly in his notes on Milton, expressed opinions on religious topics, the consequence of which he had not deliberately considered. He hated Puritans and Calvinists, but does not seem to have understood very clearly that his own church, and every pure church, has many doctrines in common with them. His opinions on Psalmody, and on the observation of Sunday, are particularly objectionable. As a contributor to the literature of his country, few men stand higher than Warton. He was the first who taught the true method of acquiring a taste for the excellencies of our ancient poets, and of rescuing their writings from obscurity and oblivion. In this respect he is the father of the school of commentators, and if some have, in certain instances, excelled their master, they ought to recollect to | whom they are indebted for directing them to the paths of research. Of Warton it may be said, as of Addison, “He is now despised by some who perhaps would never have seen his defects, but by the lights which he afforded them.” His erudition was extensive, and his industry must have been at one time incessant. The references in his History of Poetry only, indicate a course of various reading, collation, and transcription, to which the common life of man seems insufficient. He was one of those scholars who have happily rescued the study of antiquities from the reproaches of the frivolous or indolent." Amidst the most rugged tracks of ancient lore, he produces cultivated spots, flowery paths, and gay prospects. Many of the digressions that have been censured in his history, appear to have been contrived for this purpose; and the relief which his own mind demanded, he thought would not be unacceptable to his fellow-travellers. To the industry which he employed in all his literary undertakings, there can be no doubt he was indebted for much of that placid temper and contentment which distinguished him as a resident member of the university. The miseries of indolence are known only to those who have no regular pursuit, nothing in view, however easy or arduous, nothing by which time may be shortened by occupation, and occupation rendered easy by habit. To all this waste of time and talent Warton was a stranger. During the long vacation, indeed, he generally resided with his brother at Winchester, but even this was a change of place rather than of occupation. There he found libraries, scholars, and critics, and could still indulge his delight in the “cloysters pale,” “the tapered choir,” and “sequester’d isles of the deep dome;” and there, as well as at home, he continued his researches, and enjoyed solitude or society in such proportions as suited his immediate inclination. Yet as he pursued an untried path, and was the founder of his own studies, it cannot be a matter of great surprise, if he failed in conducting them with due method. To this it was owing that the emendations and additions to his first and second volumes are so numerous, as to have been made the ground of a serious charge against his diligence and accuracy. But had he lived to complete the work, he could have no doubt offered such excuses as must have been readily accepted by every reflecting mind. If we admit the magnitude of the undertaking, which evidently | exceeded his own idea when he fondly hoped that it might have been finished in two or three volumes; if we consider the vast number of books he had to consult for matters apparently trifling, but really important; that he had the duties of a clergyman and tutor to perform while engaged on this work, and above all, that his friends were assisting him, often too late, with additional illustrations or references, it will not appear highly censurable that he dismissed his volumes capable of improvement. From his own copy of the first volume of his history, and of his edition of Milton, both now before us, it appears that he corrected with fastidious cure, and was extremely anxious to render his style what we now find it, perspicuous, vigorous, and occasionally ornamented. His corrections are often written in an indistinct hand; and this perhaps occasioned fresh errors, which he had not an opportunity to correct; but with all its faults, this history will ever remain a monument of learning, taste, and judgment, such as few men in any nation have been able to produce. His poetry, as well as that of his brother, has been the occasion of some difference of opinion among the critics; and the school of Warton, as it is called, has not of late been always mentioned with the respect it deserves. Among the characteristics of our author’s poetry, however, his style may be considered as manly and ^energetic, but seldom varied by the graces of simplicity. His habits of thought led him to commence all his poems in a style pompous and swelling; his ideas often ran on the imaginary days of Gothic grandeur and mighty achievement, and where such subjects were to be treated, as in his “Triumph of Isis,” and in his “Laureat Odes,” no man could have cloathed them in language more appropriate. The “Triumph of Isis” was written in his twenty-first year, and exhibiis the same beauties and faults which are to be found in his more mature productions. Among these last, is a redundancy of epithet which is more frequently a proof of labour than of taste. The “Pleasures of Melancholy” appears to be & more genuine specimen of early talent. He was only in his seventeenth year, when his mind was so richly stored with striking and elegant imagery­In general he seems to have taken Milton for his model, and throughout his poems we find expressions borrowed with as much freedom from Milton, as he has proved that | Milton borrowed from others. One piece only, “Newmarket,” is an imitation of Pope, and is certainly one of the finest satires in our language. In this he has not only adopted the versification of Pope, and emulated his wit and point, but many of his lines are parodies on what he recollected in Pope’s Satires. This freedom of borrowing, however, seems so generally allowed, that it can form no higher objection against Warton than against Pope, Gray, and others of acknowledged eminence. We cannot be surprized that the memory of such a student as Warton should be familiar with the choicest language of poetry, and that he should often adopt it unconscious of its being the property of another. The frequent use of alliteration is a more striking defect; but perhaps these are strictures which ought not to interfere with the general merit of Warton as a poet of original genius. His descriptive pieces, had he written nothing else, would have proved his claim to that title. Nothing can be more natural, just, or delightful than his pictures of rural life. The “First of April” and the “Approach of Summer” have seldom been rivalled, and cannot perhaps be exceeded. The only objection which some critics have started is, that his descriptions are not varied by reflection. He gives an exquisite landscape, but does not always express the feelings it creates. 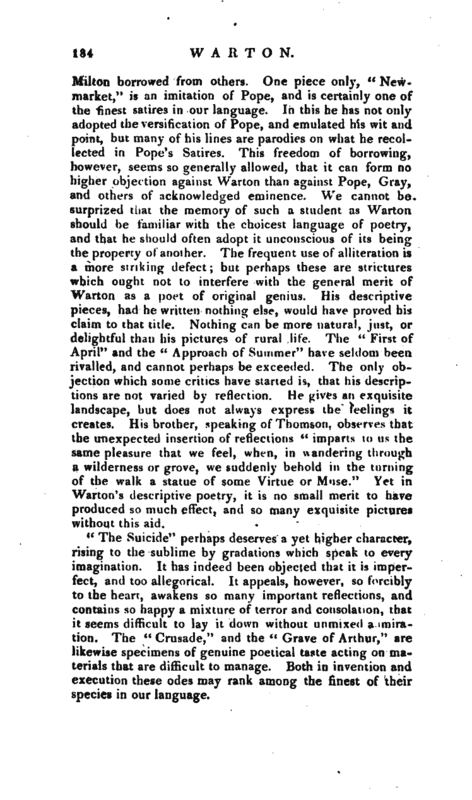 His brother, speaking of Thomson, observes that the unexpected insertion of reflections “imparts to us the same pleasure that we feel, when, in wandering through a wilderness or grove, we suddenly behold in the turning of the walk a statue of some Virtue or Muse.” Yet in Warton’s descriptive poetry, it is no small merit to have produced so much effect, and so many exquisite pictures without this aid. Mant’s Life of Warton. English Poets, 21 vols. 1810.